The wedge salad is generally more of a steakhouse standard than a football snack, but I made one for a football game and it was delicious, so perhaps bars should rethink their menu strategy from a salad perspective. In addition to being a steakhouse standard, the wedge salad is also notoriously low on any nutritional value. 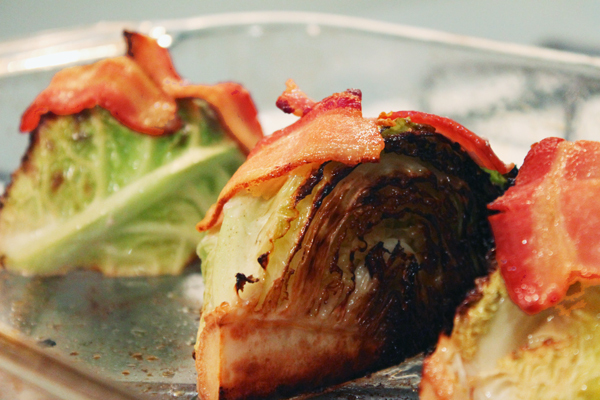 The classic wedge is made up of a thick wedge of iceberg lettuce (which isn't unhealthy, but as far as lettuces go, it's not the most nutrient rich), blue cheese dressing, and bacon. 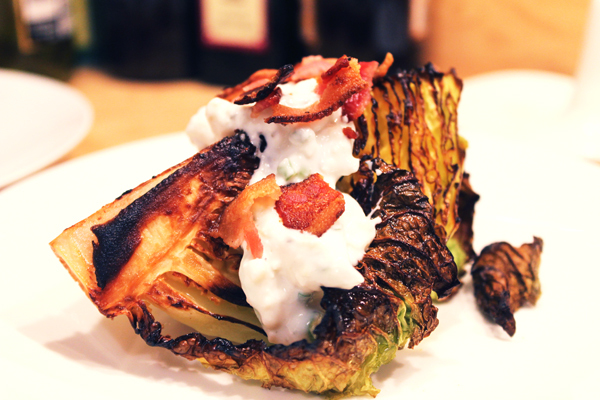 For a healthier take, I made a roasted wedge of cabbage, with Greek yogurt and blue cheese dressing, with a bit of bacon for flavor. The cabbage is a much richer source of nutrients than iceberg lettuce, and the Greek yogurt dressing is a much healthier alternative to the typical mayo and sour cream or even buttermilk variety of blue cheese dressing. The bacon, while not especially healthy, is a minimal addition to the dish that adds color and flavor along with some protein and saltiness. The cabbage also adds a deeper layer of flavor while still maintaining the crunch you get from the more typical iceberg lettuce. This seemed and looked so tempting except that I don't eat bacon. I really feel like trying the recipe now for today's dinner by replacing bacon with chicken but sadly I don't have any cabbage right now.